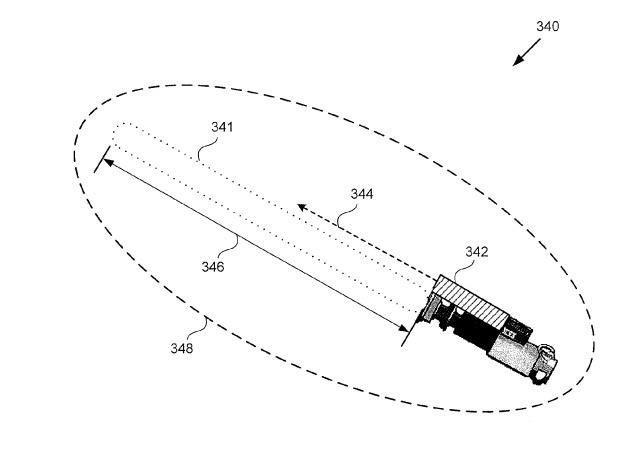 A newly-filed patent application from Disney Enterprises, Inc. teases more augmented reality lightsaber duels, either for at-home gaming or for the media behemoth's forthcoming Star Wars theme park. 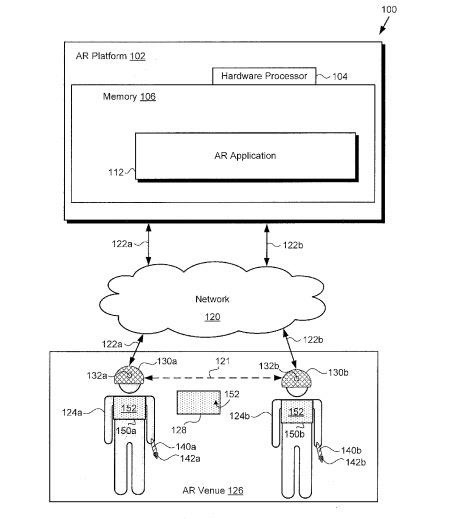 The patent, titled "Augmented Reality Interactive Experience," describes a system that would involve a networked application running on computers and head-mounted displays that also connects to peripherals that transmit and detect infrared light, and an "AR venue" in which the experience would take place. Players would carry swords or blasters equipped with IR emitters, with light-detecting cameras embedded into the headset or a wearable component that reflects light to determine position. The application would run the experience and keep score of IR hits. The patent also notes that one implementation of this patent could involve an inserted smartphone acting as the computer, display, and IR detector. In discovering the patent, the Orlando Business Journal theorizes that the patent points to possible augmented reality games hosted at Disney's Star Wars Galaxy's Edge parks opening in 2019. Last year, I floated similar speculation. Certainly, the term "AR venue" implies an amusement park attraction. However, the credentials of the inventors reveal a potential at-home AR experience. The inventors listed on the patent are Nathan Nocon, senior manager of hardware engineering for The Walt Disney Company, and Katherine M. Bassett, research and development manager at Disney Consumer Products. According to Bassett's LinkedIn profile, she has previously worked on the Star Wars Jedi Challenges AR headset. Another patent application with her name attached, "Systems And Methods For Tracking Objects For Augmented Reality," describes the lightsaber controller and tracking beacons used in that gaming set. That patent was published on Sept. 7, 2017, just days after Jedi Challenges became available for pre-order. Considering the consumer products pedigree of the team and the noted smartphone implementation, this patent could preview a next-generation Jedi Challenges game. With advancements in ARKit and ARCore, horizontal and vertical surface tracking could be enough to establish the boundaries of an "AR venue" for gameplay. Another AR game, Father.IO demonstrates how an infrared controller can facilitate multiplayer first-person shooter games in real world environments. 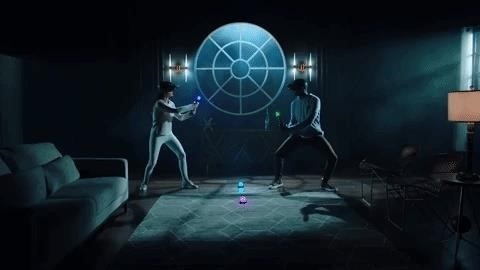 Disney and Lenovo have already accomplished multiplayer lightsaber battles with an update to Jedi Challenges, so infrared lightsabers and blasters sounds like the logical next step. As with most patents, the technology described does not necessarily guarantee a real world implementation. However, considering the patent owner's current products and forthcoming attractions, it seems likely that we'll find out whether it is actually realized within the next year.